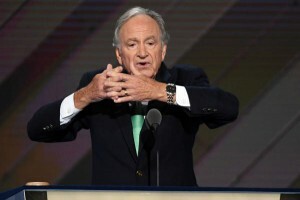 Harkin also called for an end to subminimum wage and a passage of the Disability Integration Act “so our fellow Americans can live where they want,” two items that Democratic nominee Hillary Clinton supports. “As president, Hillary Clinton will bring people with disabilities to the table for a more inclusive America,” Harkin added. While Harkin spoke, he was surrounded by a group of individuals with a variety of disabilities, including RespectAbility’s own James Trout, a policy and democracy fellow with Asperger’s who spent more than a month in Iowa and New Hampshire engaging candidates on both sides of the aisle in issues important to the disability community, specifically relating to employment. Prior to Harkin’s speech, Paralympic swimmer and gold medalist Mallory Weggemann recited the Pledge of Allegiance and Temple University student Timmy Kelly, a blind man who is majoring in music, sung the national anthem. People with disabilities constitute fully one-in-five of America’s population – more than 56 million Americans. With 20 percent of Americans self-identifying as a part of the disability community – and the majority of voters having a family member or close friend with a disability – it is in the best interest of candidate who wants to be elected president of the United States to seek out the votes of people with disabilities. According to word searches compiled by The New York Times, the word disability did not even register on the word clouds during the 2012 conventions by either party.